Friedewald’s equation for calculating LDL-cholesterol: Is it the time to say “Goodbye” and adopt direct LDL cholesterol methods? Objectives: To measure correlation and concordance between measured LDL cholesterol (mLDLc) and Friedewald’s calculated LDL cholesterol (cLDLc). To compare the mLDLc and cLDLc values for various anthropometric measures and biochemical indices including insulin resistance, nephropathy, glycated hemoglobin and triglycerides. 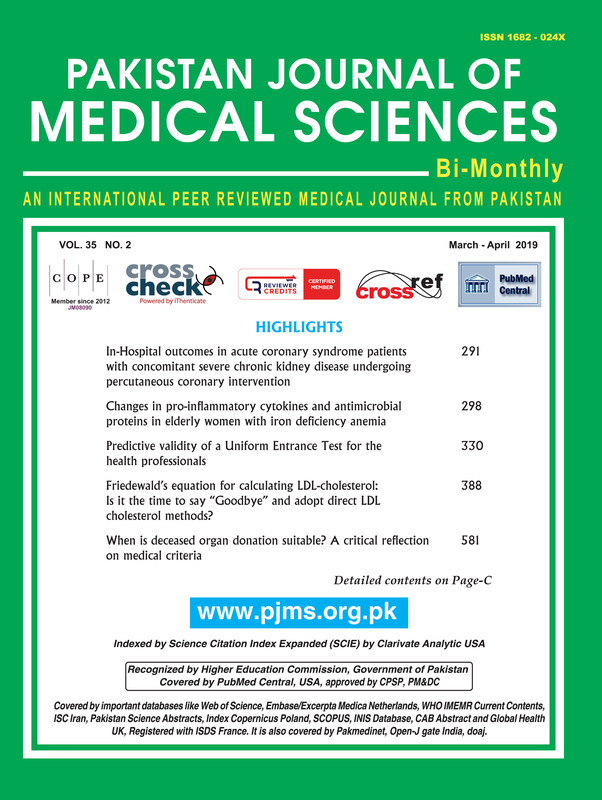 Methods: Two hundred thirty two subjects were included in this cross-sectional analysis from Jan-2016 to July-2017 from a target population visiting PNS HAFEEZ hospital. Mean age of the subjects was 46.56(±11.95) years (n=232). These subjects underwent clinical evaluation including measurement of anthropometric measurements, biochemical testing for fasting plasma glucose (FPG), glycated hemoglobin (HbA1c), lipid profile, urine albumin creatinine ratio (UACR), and insulin. Correlation and concordance between mLDLc and Friedewald’s cLDLc were measured. Finally, Comparison of risk evaluation for mLDLc and cLDLc between groups formulated based upon UACR (Based upon a cut off of 2.5 mg/g) and fasting triglycerides (Group-1 :< 1.0 mmol/L, Group-2: 1.0-1.99 mmol/L and Group-3 :> 1.99 mmol/) was carried out. Conclusion: cLDLc over estimates LDL-cholesterol in comparison to mLDLc. The correlation between cLDLc and mLDLc was only moderate. However, cLDLc provided better degree of risk prediction for nephropathy and glycated hemoglobin than mLDLc.